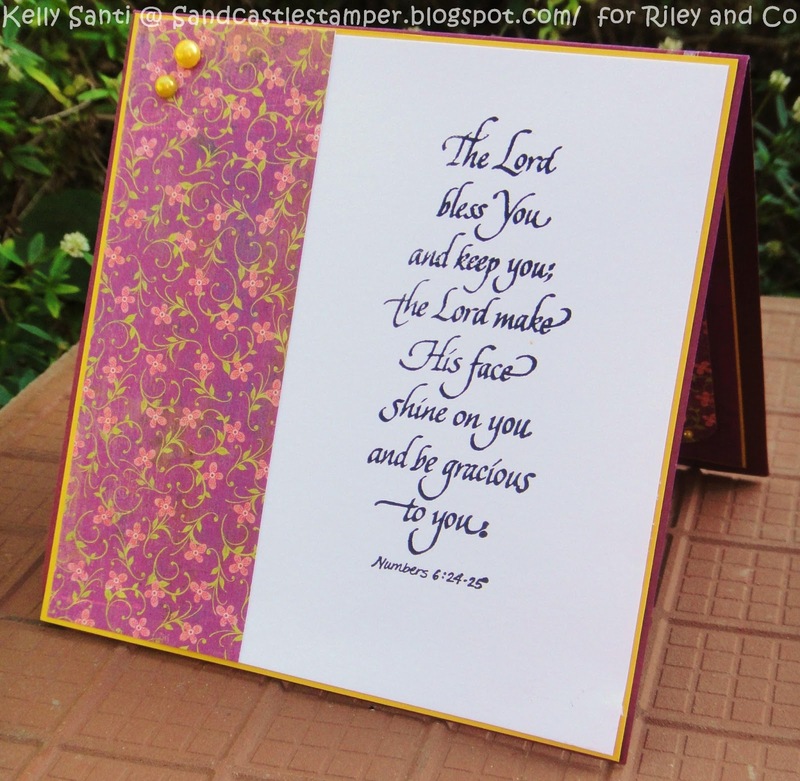 Crafters of Faith ~ Smile! 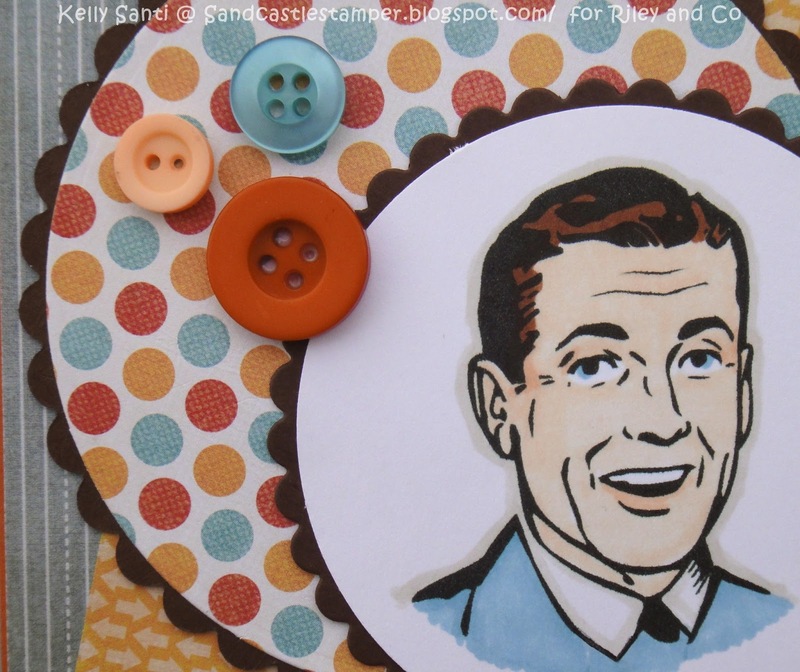 Proverbs 15:13 says "A joyful heart makes a cheerful face"
And it's posting day for the Crafters of Faith! This is always a fun time to post and this month is no exception. Our lovely hostess, Sharon, gave us such an amazing challenge to work with this time around. 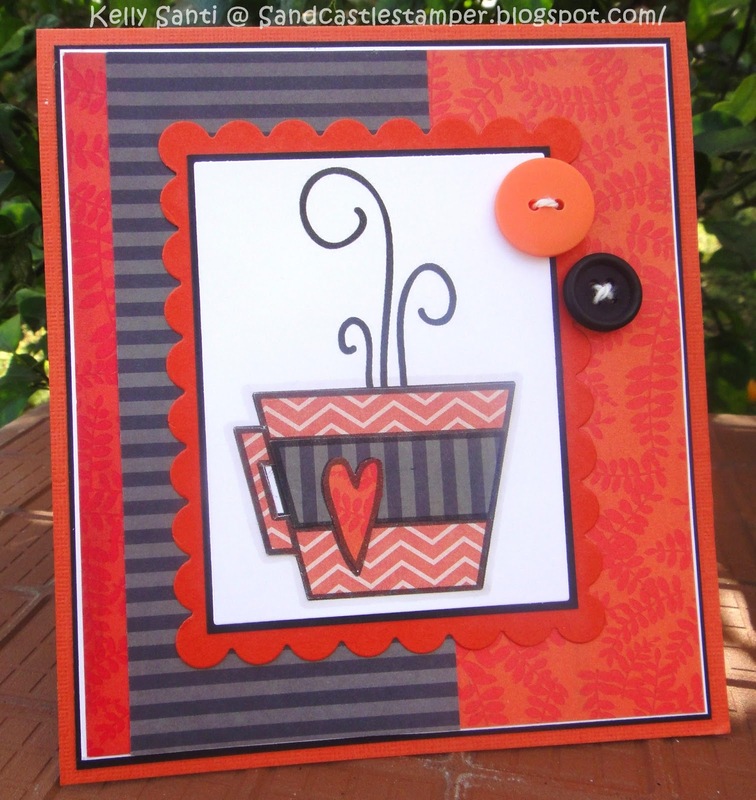 * For this challenge, I would like to see you use both old stash and new stash to create your card/project. * To add a little fun to the challenge, I'd love to see you try a new technique -- something you've never done before. You can check out google, youtube, or even the SCS forums and galleries for inspiration! * Make sure you tell me what's new and what's old and post a link or give a little description of the technique you used. And that's about it from me for today! 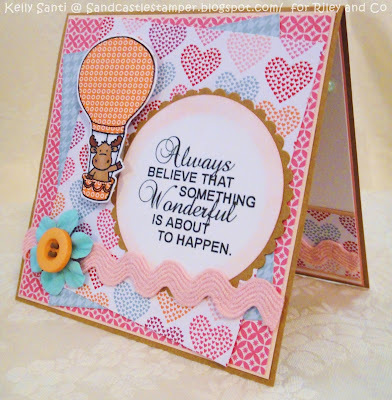 and see what beautiful creations they've created this month! Last year was "Take it off the SHELF in 2012" which inspired me to use some of the SU! stamp sets that I bought on a binge when I first started card making! I was so proud that I followed through with my challenge! So this year? Hmmmm, '13. That's a tough one! You could rhyme it with the "thirt" part ..... or the "teen" ... what to do! Then I remembered that I really loved the process of learning new things last year - whether it was a challenge tossed down or a DT requirement to a simple browse through a gallery and thinking "I would love to try that!" I'll be LEARNing in 2013! 2. 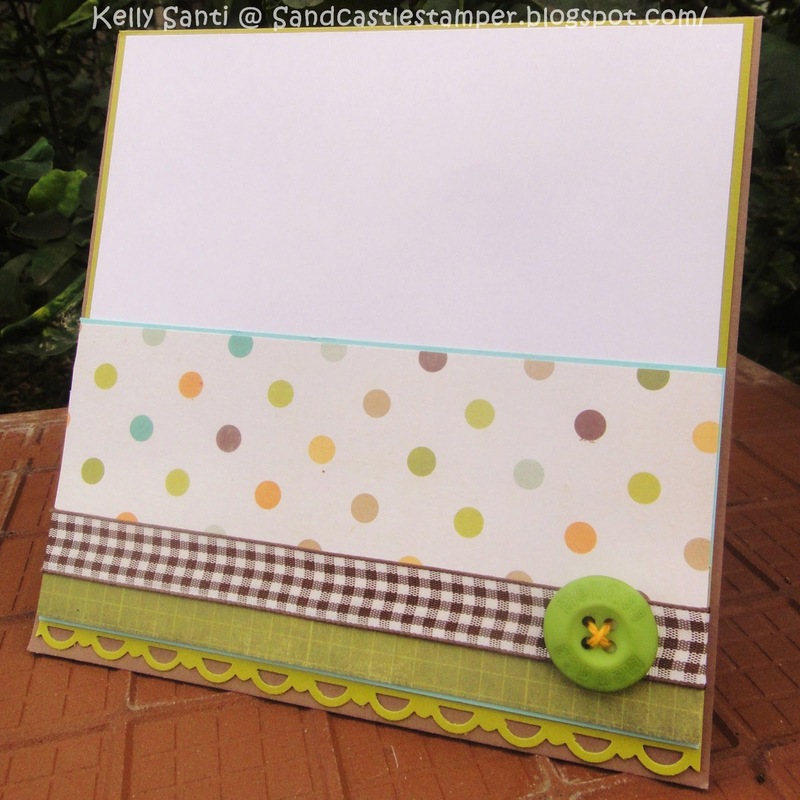 To learn to love scrap-booking again! This was my first crafting love and I promised my girls I'd get those pages done! 3. 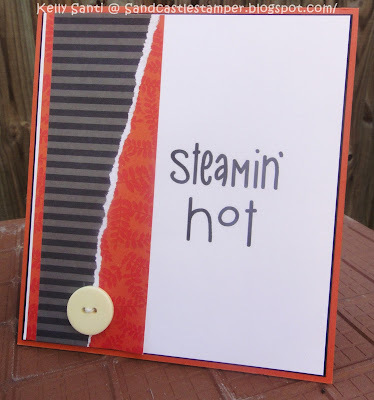 To learn new techniques with the stamps + papers I own rather than "stay stuck in a rut!" 4. 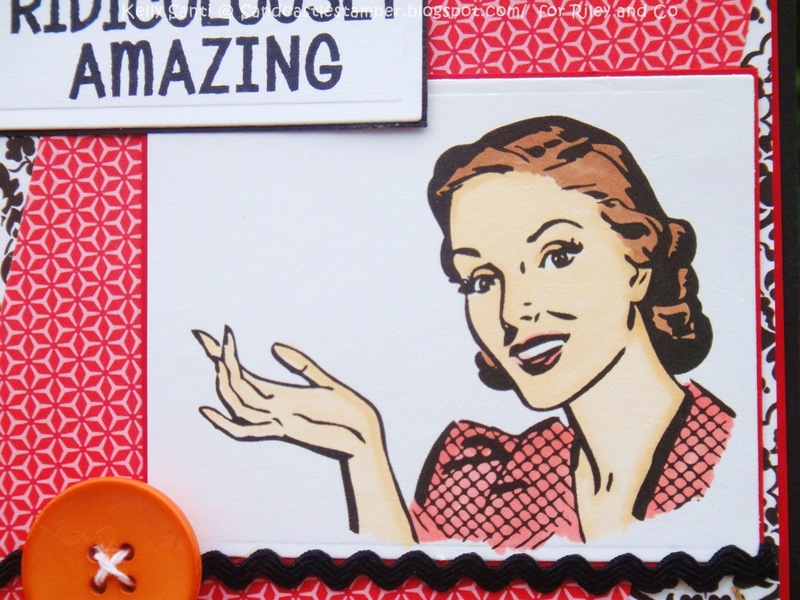 To learn to use each item I've been gifted or won in a blog hop/candy! I'm so excited about that one! 5. To reconnect with all the challenge sites I've learned about - new and old! 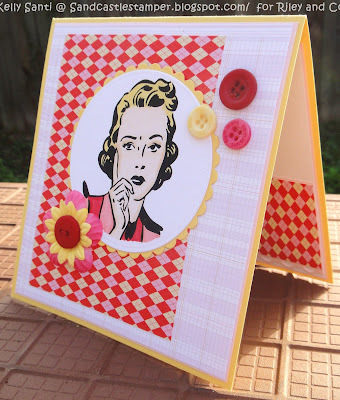 And right out the gate, I am excited that the Calendar Girls' hostess, Jeanette, gave us a challenge this month that sort of allows creative freedom! We are to find a picture - either on the web or one of our own - and create a card/project inspired by that. I have so very many pictures that inspire me but truly one of the greatest loves of mine to craft are scriptures. 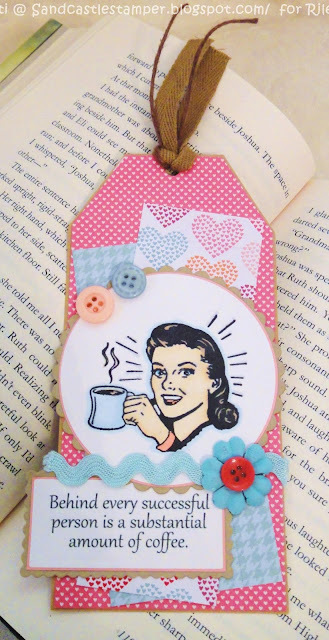 I find that even in my walk of faith, I like to include a craft from time to time - be it something creative in my church women's fellowship or maybe a card or faith-book page! Literally, my intended card bothered me so greatly that I started all over, pretty much at zero hour! I typed in christian images and this one was like the 3rd one I saw - and it felt like "the one!" I intended to make a CAS card with just one layer of dsp - the purple colored background, but I failed big time! I just couldn't do it :) I quickly added a few more layers and colors to the card and am much happier with it ... I guess beauty is in the eye of the beholder, in this case! 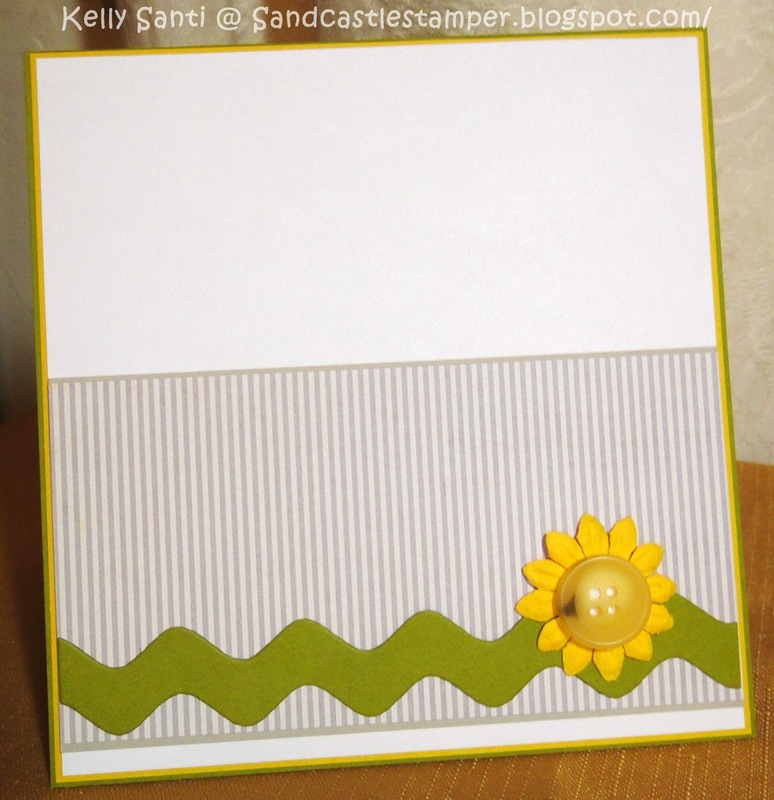 For this card, I used an old set of stamps from Stamps Happen that have NEVER seen ink, shamelessly! They inked up perfectly and were so wonderful to use! The petals and flower are actually a half flower. I over-layed the stamp to create a full flower, added a few stickles and propped it up on 3D dots for a bit of dimension. What I did different for this LINY card #1 was use my aqua painter and water color crayons to create the flower. 3. 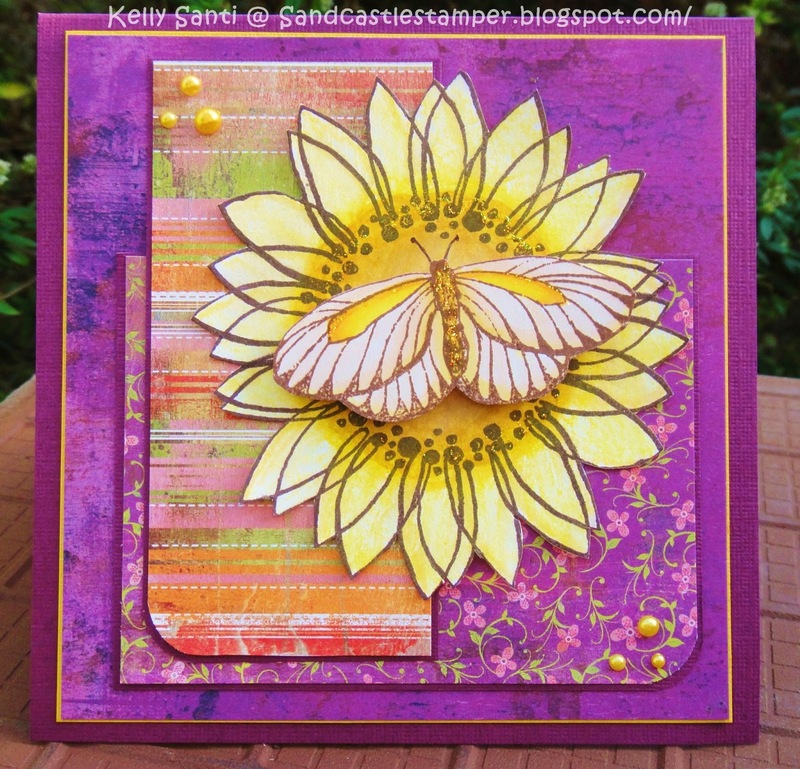 Aqua painter and water color SU crayons - dusted off and put to good use! Whew, thanks for reading this super long post! I'm excited to be starting off the new year fresh and ready to conquer many of my 'bucket list' crafting items :) I made lists. ALL. the. time. But this is the year to get them DONE! 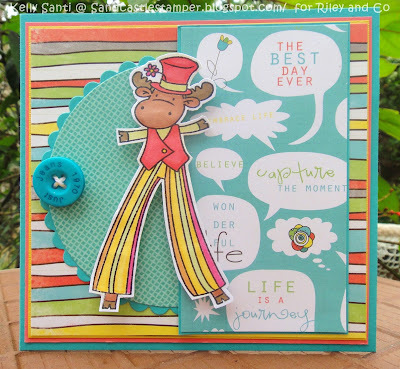 Riley and Co BLOG HOP! ~ "Always Believe!" 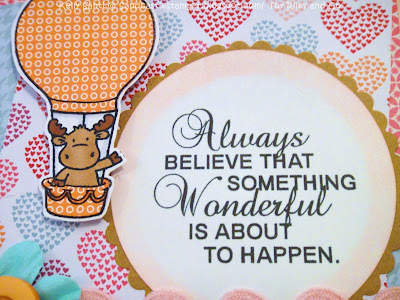 First up, a card featuring the Funny Bones stamp "Always believe that something wonderful is about to happen." 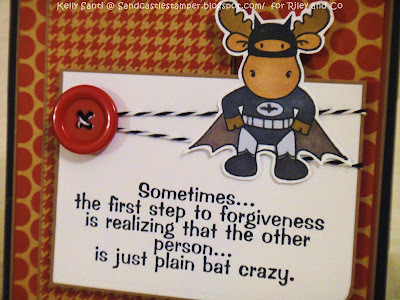 That statement literally takes my breath away ~ and plan to have this stamped all over just about everything this year! 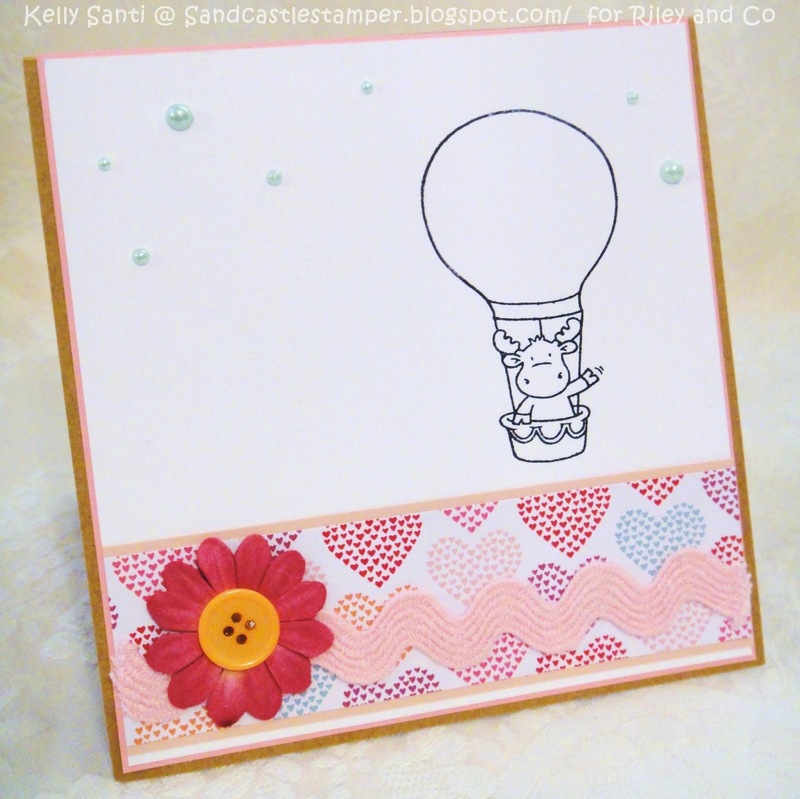 I've added the hot air balloon Riley because he makes me smile :) Next, the papers on both the card and bookmark are a mix of Valentine papers and I chose some slightly off colors due to my love of non-traditional looks. I gave them a slightly collage-y look (hee hee - is that a word?!) 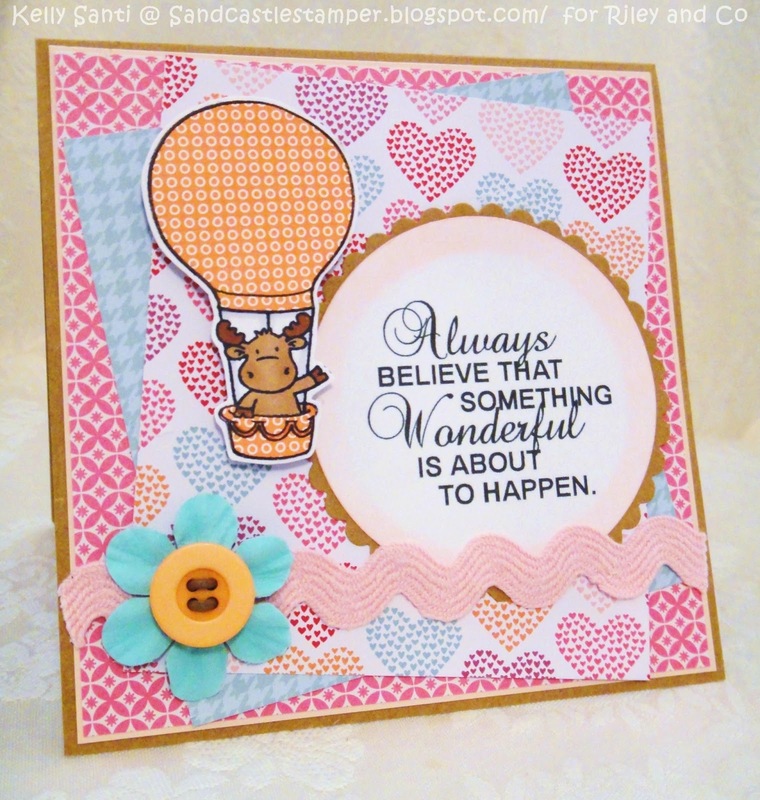 I paper-pieced the hot air balloon and baskets as I love to paper-piece. Special #1: Buy an unmounted sheet of ALL the 13 new people for only $50.00! (reg. $6.00 each). That's a savings of $28.00! Riley Sneak #5 ~ Plain Bat Crazy! Hiya! 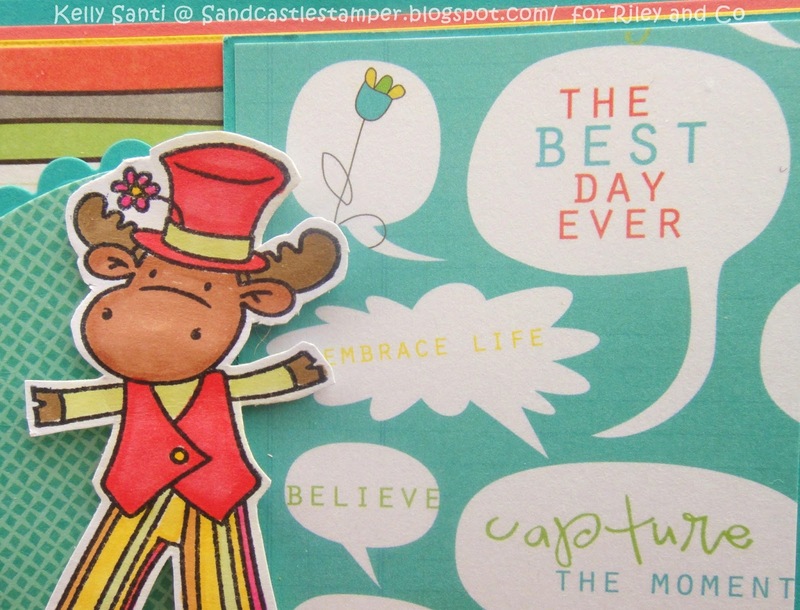 Only one more sleep til the big blog hop and new stamp release! 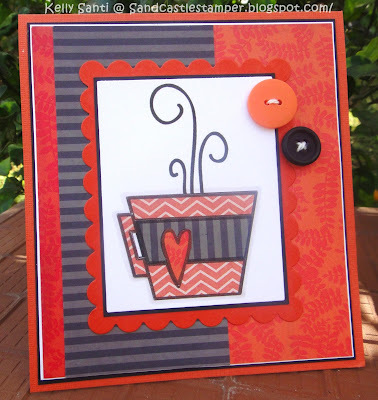 Be sure to check out the DT blogs and of course, stop on back for the new stamp release blog hop starting on Jan. 24, Thursday! For one lucky winner at each stop on the hop, you can chose a stamp of your choice from this fun and funky Retro Girls and Guys stamps or from the 36 new Funny Bones stamps being released. Wow! 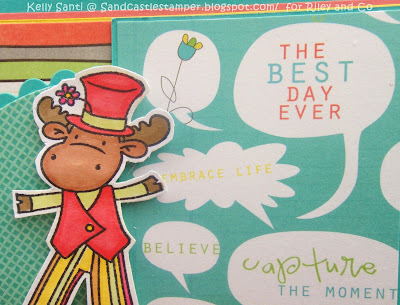 And a word from the headmoose - Tanya! Special #1: Buy an unmountedsheet of ALL the 13 new people for only $50.00! (reg. $6.00 each). That's a savings of $28.00! 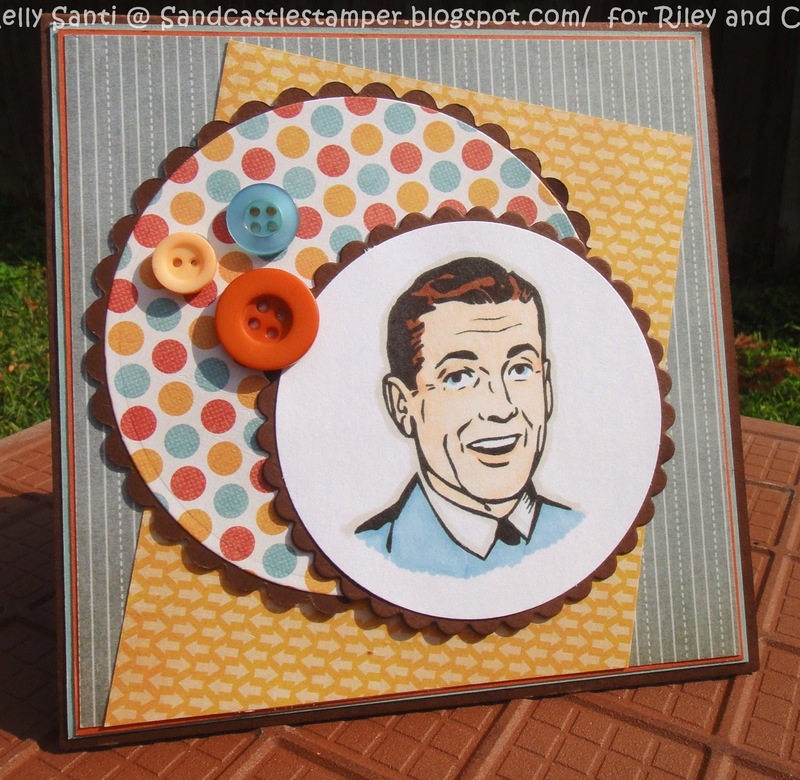 The new Riley and Company bi-weekly challenge is to create a 'card for the guys' so stop on by the challenge blog and play along! Be sure to check the Riley and company DT blogs (in my sidebar!) for more sneak peeks and of course, the big Riley and Co blog hop this Thursday, Jan. 24th! 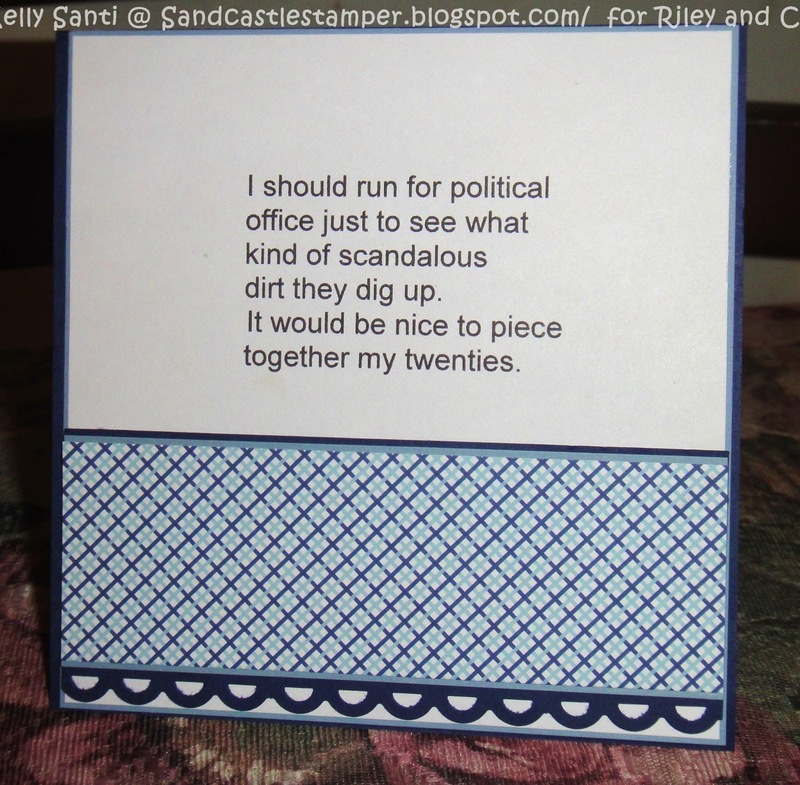 Riley Sneak #3 ~ Run for Political Office! Hi everyone! It's day 3 of the Riley and Company new stamp release sneak peeks! 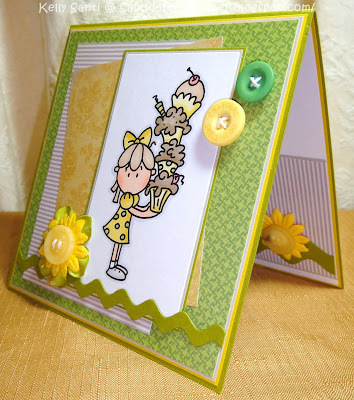 I've used another retro girl, paired with a new Funny Bones stamp sentiment as well. 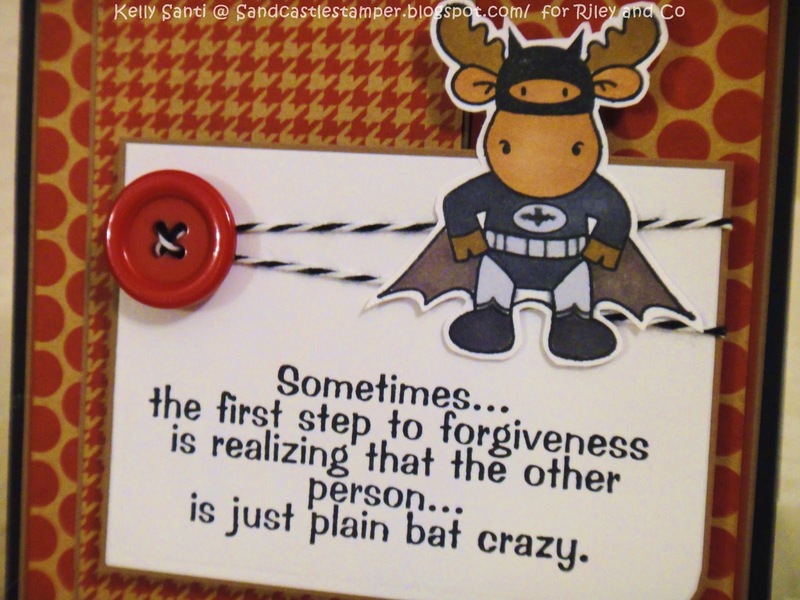 This sentiment is one of my favorites of the 36 new stamps being released - hilarious!! 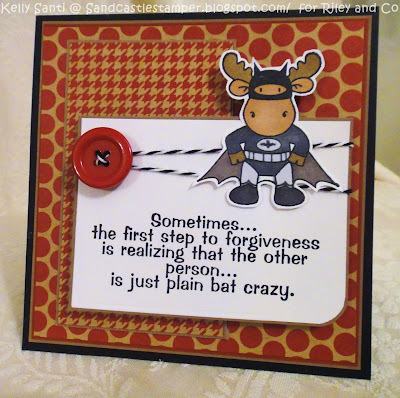 Join us for our release Blog Hop this Thursday 24th January 10 PM EST, starting on the Riley and Company Blog. New Release Stamps available in the Riley and Company Store from Thursday 24th January 10 PM EST. See you back tomorrow with another fun release!! Riley Sneak #2 ~ What were you thinking?! Good morning! 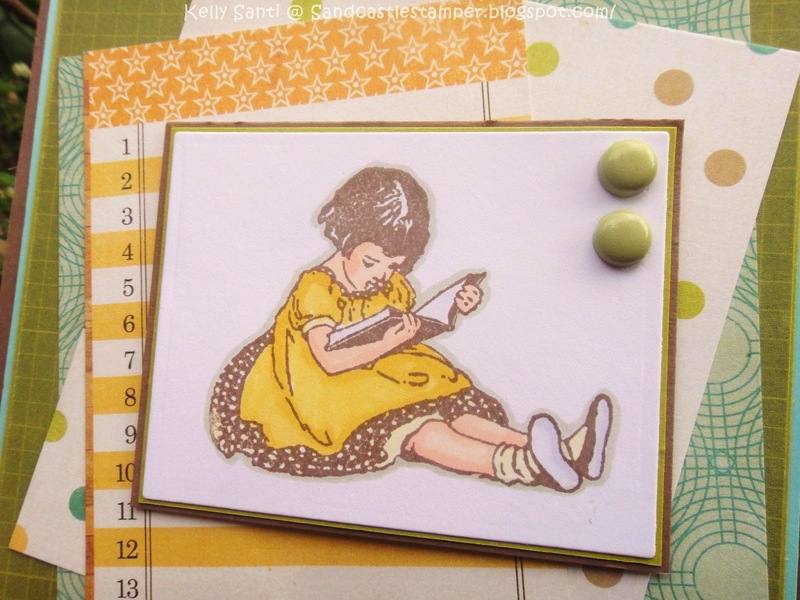 Here's another sneak peek view at the upcoming Riley and Company stamp release ~ sneaks are going on all week! 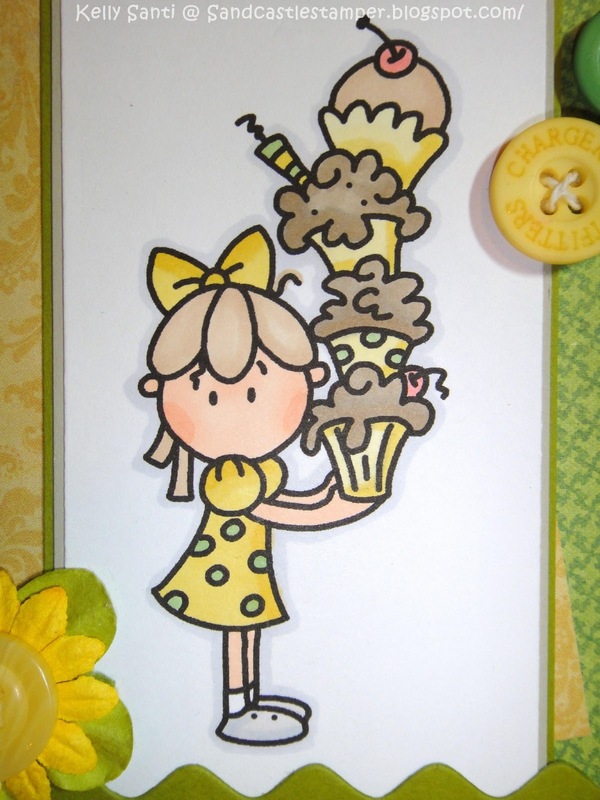 For today's card, I am using another fantastic retro girl ~ I just adore her! I can imagine her thinking so many things :) I've paired her with a new Funny Bone release sentiment "What were you thinking!" 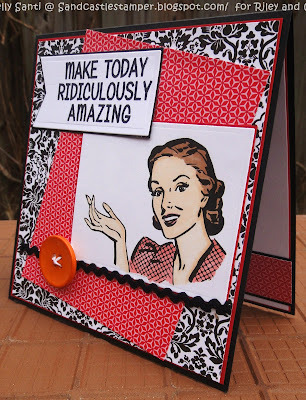 Be sure to stop by the DT blogs to see what they are sneak peekin' for you today! And please join us for our hop on Jan. 24th, Thursday for the final reveal and blog hop! Riley Sneak #1 ~ Ridiculously Amazing! Hi all! 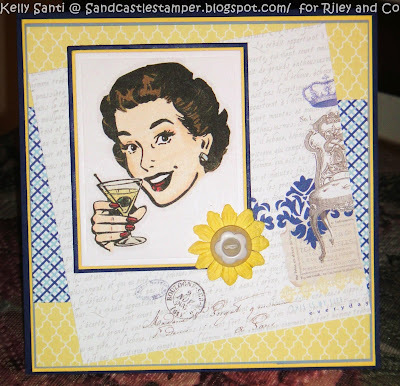 Can you believe it's time for another new Riley and Company stamp release? This month, there will be 36 new Funny Bones sayings that are absolutely hilarious and 13 brand new retro style men and women! 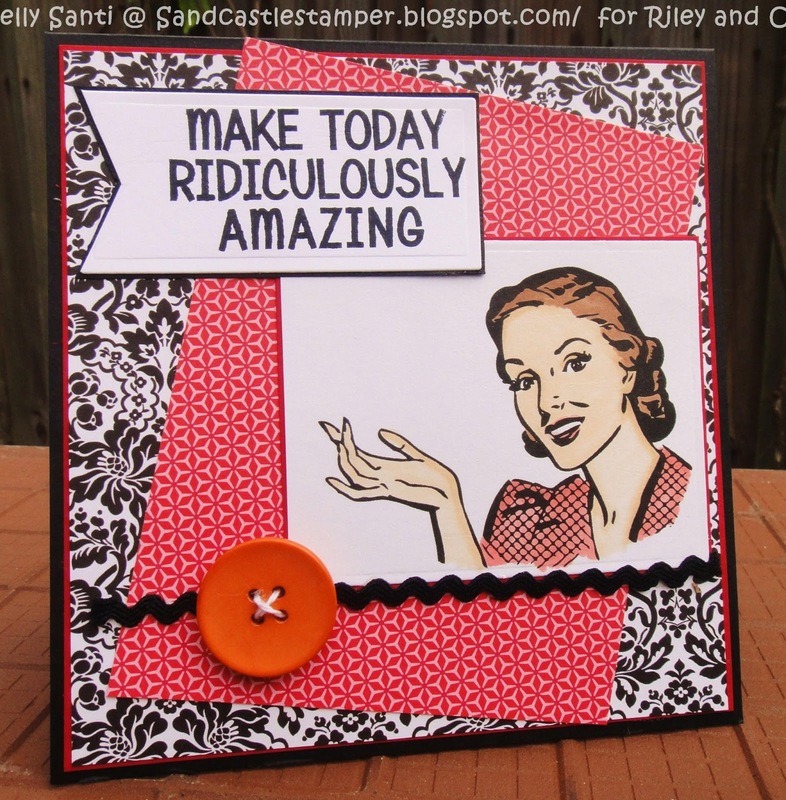 That's right - Riley and Company stamps are heading a new direction this month! We will have sneak peeks for you all week with a new stamp release blog hop on Thursday, January 24th! 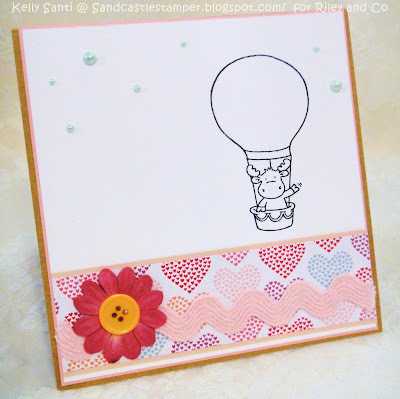 For more DT inspiration and sneaks at other stamps released, please visit the Riley and Company DT listed in my sidebar. A little young, I know! But he’s a product of a mommy that loves to write and journal, fits ‘scriptures’ into everything, dabbles with poetry and …. make lists :) Yup, I’m a list maker. A few things on his bucket list? 1. "To become a pastor. Or a doctor." He says the jury is still out, but either way, he’ll be helping people. Gosh, I love this boy! 2. To go back to Tennessee. We only visited twice for vacation but it placed a hand on his heart. 3. Go to the circus! Around the holidays, I noticed ads going up around town for Ringling Bros. and Barnum + Bailey. I promise I won't go into a soapbox of why I struggle with the circus but take to heart that instead my son's dreams came true this day! He wasn't able to sleep the night before and was up at 5:30 am on a Saturday morning - ouch! We had such a blessed and most wonderful time! He did not stop smiling all day ~ from meeting the clowns, visiting the circus animals in the pre-show, having popcorn and snow-cone and cotton candy (I have a belly ache just typing that!) and, of course, the show itself. I learned so much on how much animal conservation and how RBBB is an ambassador to endangered animals. We both pledged to wear our 'awareness bands' that they gave to us to remind everyone to learn more and bring awareness to the most magnificent creatures in trouble. I think every day should be a little Suess-ical! 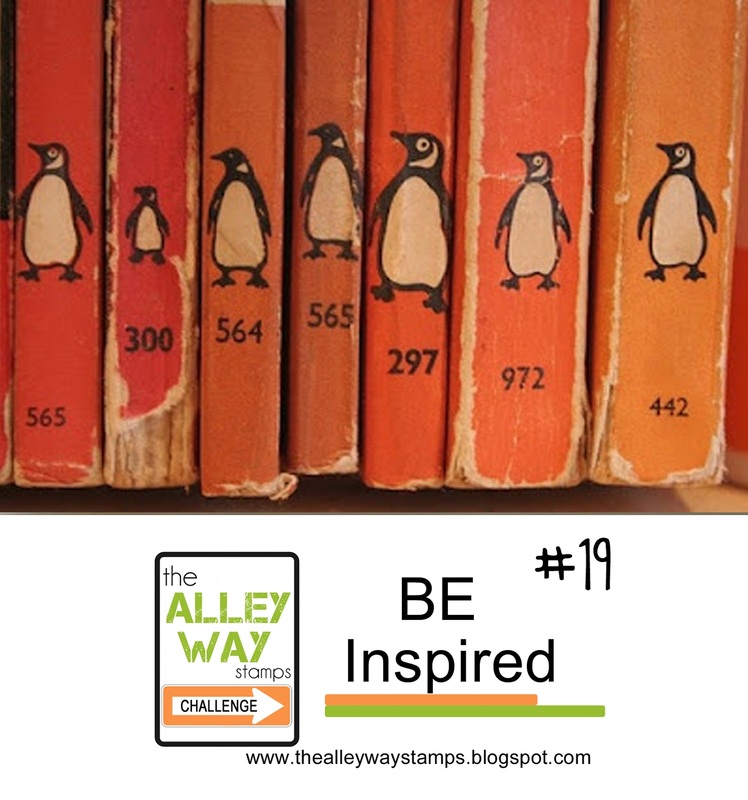 January is "Book Blitz Month".....use a stamp with books and/or reading as a theme. We would also like to then add in your post who your favorite author is, or your favorite book and why. card inside - left blank for future use! 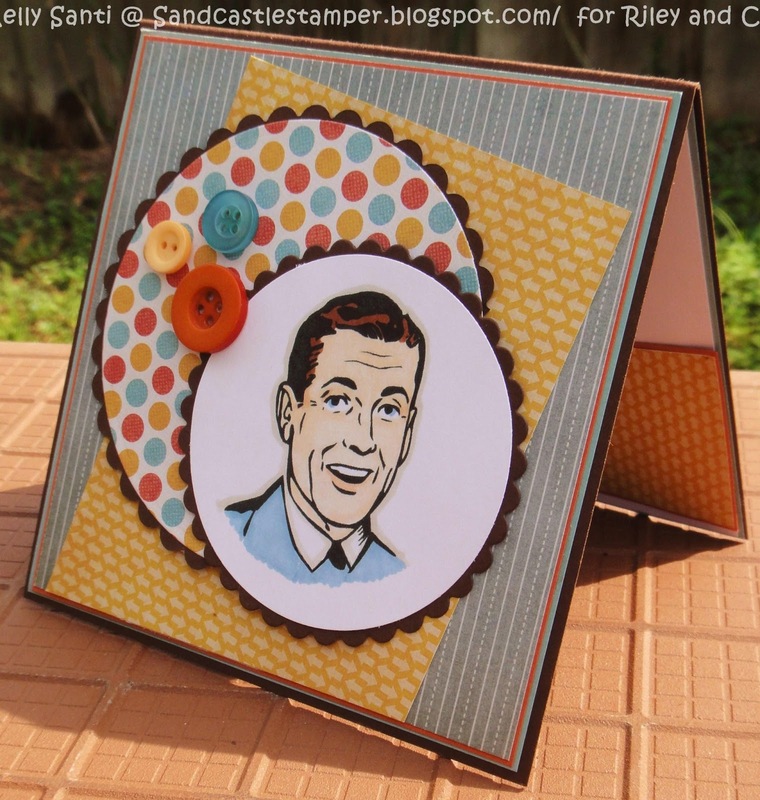 But instead, how about you see what my team Divas created using this identical image and paper! You can find them in my sidebar as well as the girls of team Dazzlers! You won't be disappointed! and couldn't wait to create a card. The picture is splendid ~ isn't it cute! and pulled from the colors of the photo inspiration #19. After coloring my image and layering it onto my card, I had a inkling (hee hee! No pun intended!) to paper-piece it instead and I'm so glad I did! I added the matching sentiment to the inside of the card. 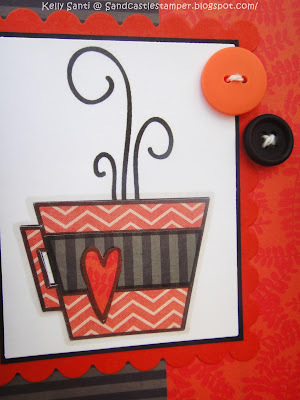 I love the vivid, contrasting colors of the picture and absolutely adore non-traditional type cards ... wouldn't this make a FUN Valentine's card! 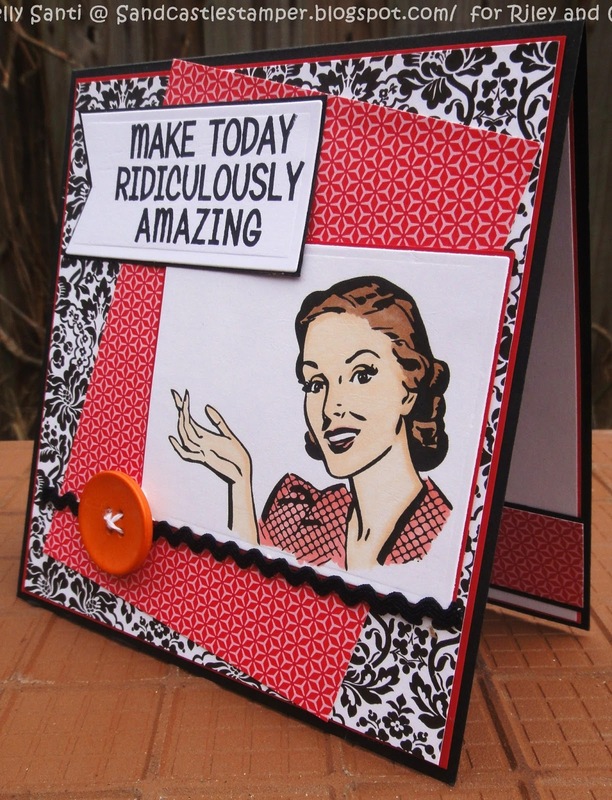 gets here :) Hope today is a crafty one for you! Today's post is one that speaks from the heart :) As I watched my 8 year old son riding his bike at the park, shouting "YAHOOOOOO!" every time he passed me, I smiled at the realization that this is truly what life is all about. This year? 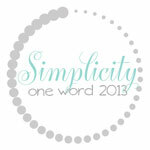 I am refocused, recommitted, re-energized and ready to live a year of Simplicity. Simplicity? According to Websters, that has a meaning of being simple, plain, freedom from hardships. But more-so ... beyond that ... I want to slow down more and share this world God intended us to be with them on a more deliberate level. I've always been a stop and smell the flowers kind of gal. And the sandcastle builder, the nature walker, the cloud watcher, the rock skipper, the one who watches two butterflies dance in flight and think "Thank you GOD for that beautiful moment!" But there is so much I know I'm missing. This is the year I plan to recapture it back again :) Simplicity. My dear husband jokes: "Simple? Like we're going to make our own homemade toothpaste and grow turnip greens?" A couple years back, I bought and devoured Ann Voskamp's "One thousand Gifts" book. 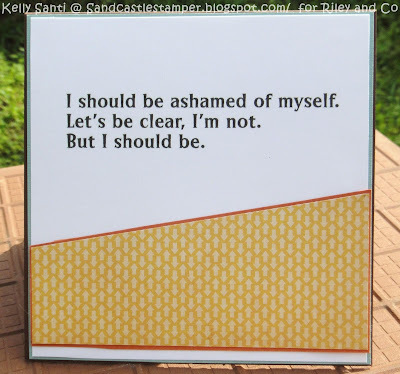 I was so inspired, I started a list of my own WITH photographs to memoralize in my smash/scrap books. And I got to Feburary! 161. My “This isn’t a souvenir, it’s a proof of survival!” t-shirt from zip-lining. God, I hear you. I know there is a lot that I am missing. But I am thankful for much. My children know and worship an awesome God. They put him first in all things - thoughts, prayers, actions towards others. And for me? I can learn to let go of any and all things that do not bring me closer to him! Simplicity. So the next time we are on those bikes? We'll take time to get off and skip a few of those rocks. Because the rocks aren't there to block our path. They are there for us to pick them up and skip the across the water of life. May you be so richly blessed this year. 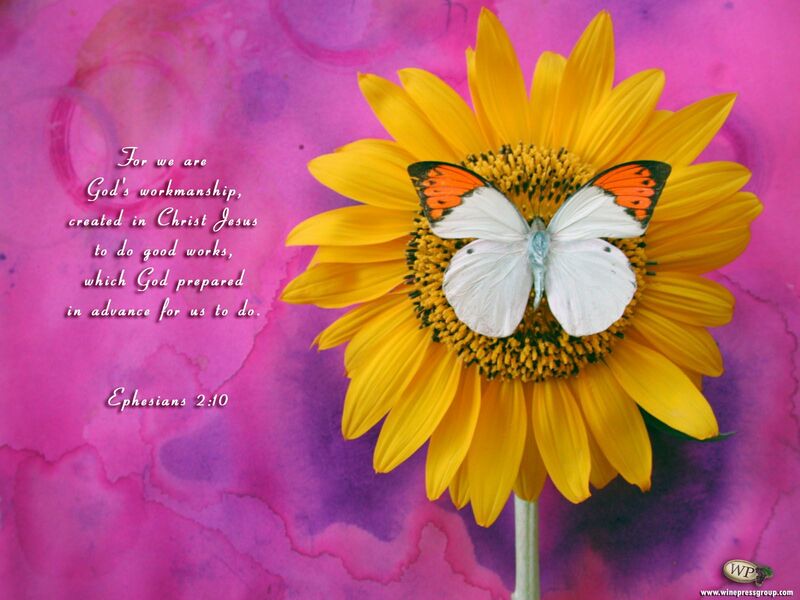 May God speak to your heart and guide you! Great big special thanks to Melanie at Only a Breath for taking the time to make the blog buttons as a wonderful reminder for all of us to remember the reason for the journey! I'm humbled to receive this and am grateful to your generosity and creativity! 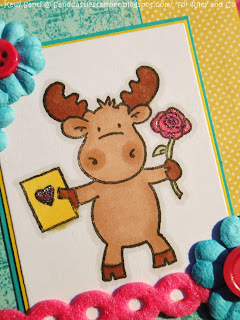 For my Riley card today, I used Sweetheart Riley and added glitter to the rose and Valentine's card. Wouldn't this be a sweet card to give - or receive! Riley is a charmer! 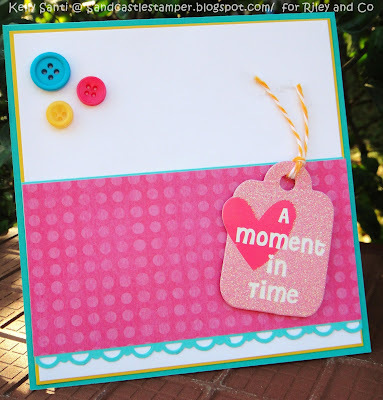 I was excited to stumble upon yet another challenge blog and loved the bright, vivid colors of their challenge and used that as my base for creativity. And it also matches Buddy's lights, don't you think? LOL! 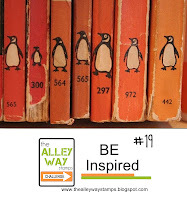 For more DT inspiration, please visit their blogs on my right hand side-bar. colored with prismacolor markers; Martha Stewart glitter; Border punch SU!, twinery twine, Fancy Pants buttons; eksuccess flowers; misc felt border ribbon. I have loved them for so long and was so excited to see a little before the holidays that I had won a Gift Certificate for participating in their 12 days of Christmas :) Thank you, Bugaboo! And what's more - the win came with a Guest DT spot for February and March - can you spell H-A-P-P-Y!! 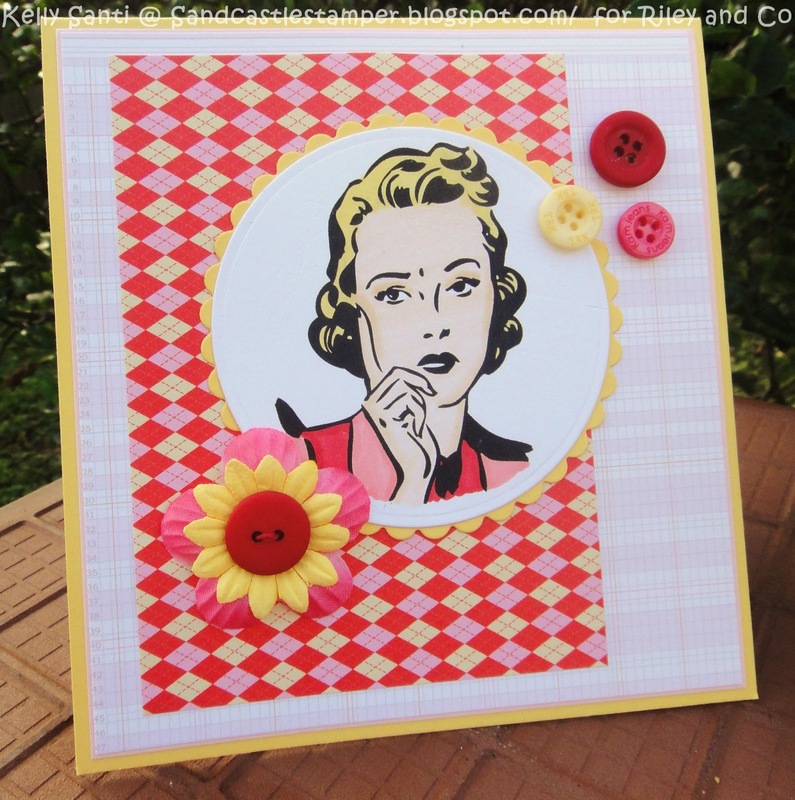 This week, I was chompin' at the bit to play along with their challenge and it's Anything Goes! I colored up one of the birthday digis which is just absolutely adorable ~ wee ones cupcake tower :) I adore challenges that take me out of my comfort zone and am striving to find as many as I can this year to play along with. One of my favorites are color challenges! 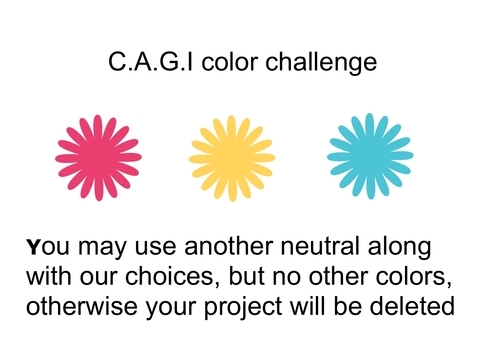 I was happy to stumble upon the CAS blog and was intrigued by this week's color combination, one I certainly wouldn't have thought up on my own! So with these three colors, WO cupcake and a birthday theme in mind, here's what I came up with. I left the inside blank for future use but kept the paper theme through-out.